This specimen was observed within the broad flood plain formed by the Gila River near Painted Rock Mountains, Maricopa Co., Arizona, USA. 01 Nov 2008. It is an adult female, ventral view. She is facing head down. 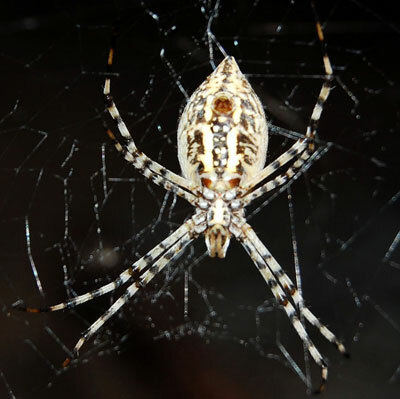 This large orb-weaving spider is found mostly in warm climates throughout the World. In the Sonoran Desert it is most likely to be encountered near agriculture and along riparian zones, i.e. where prey such as grasshoppers and bees are abundant. The web is a large orb stretching a meter or more in width. There is often a zigzag layer of silk near the center upon which the spider sits.